Vector Art of Rainbow Dash, as she try to put on AJ's hat just for fun in one of the "Best Gift Ever" shorts. 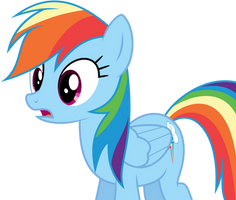 "Rainbow Dash" from "My Little Pony: Friendship is Magic" is owned by Hasbro ©. Oh yes, same things goes to Andrea Libman who voice "Pinkie Pie" and "Fluttershy" and Tabitha St. Germain who voice both "Rarity", "Princess Luna" and "Flurry Heart"
Oh, Pinkie Pie was also voiced by Fluttershy? I didn't know that! AJ: You look cute in mah hat. Rainbow Dash: AWWW YEAHHH, I do look nice wearing your hat when I'm in the sky. AJ: Why don’t you come down here and we can “wear” my hat some more? And she is trying to impersonate AJ.